"An edgy vision of millennial lunacy." 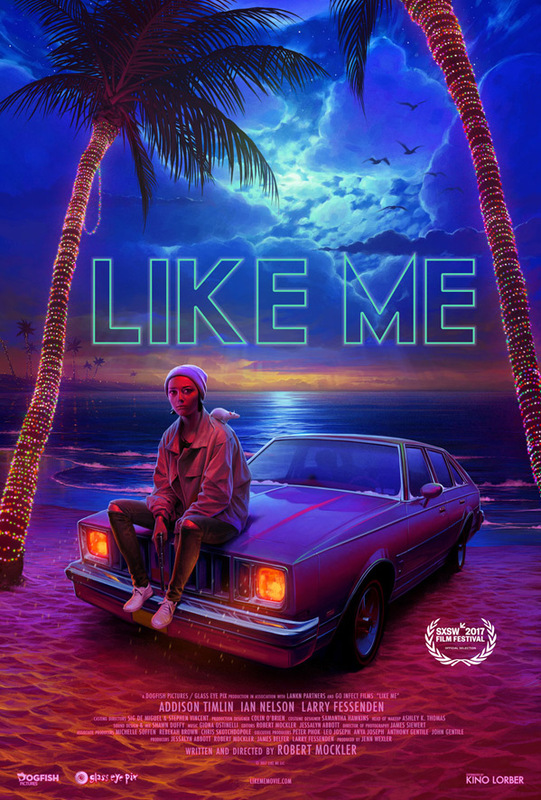 Kino Lorber has debuted an official trailer for the indie psychedelic horror feature titled Like Me, the feature debut of director Robert Mockler. This film is a reflection of the times, telling a twisted coming-of-age story about a young woman who sets out on a crime spree that she broadcasts on social media. Starring Addison Timlin (from Little Sister, Fallen, Submission), along with Ian Nelson, Jeremy Gardner, and Larry Fessenden (who also produced it). This has some seriously trippy, neon visuals and Jodorowsky-esque set pieces that some will love, some will hate, but I'm definitely curious. The film "takes the viewer into a world of fabricated personalities and offers a thought-provoking portrait of isolation in our increasingly digital world." Worth a watch, just for the totally wild visuals alone. A reckless loner (Addison Timlin) sets out on a crime spree that she broadcasts on social media. After releasing a video of herself robbing a convenience store, she amasses a huge following. While traveling along the coast, she encounters a drifter, an Internet troll, and a paint huffing outsider who are all pulled into her circle of chaos, junk food, and drugs. Like Me is both written and directed by newcomer Robert Mockler, making his feature directorial debut (follow him @robmockler). This first premiered at the SXSW Film Festival, and also played at the Indianapolis, Bucheon, Sidewalk, and The Overlook Film Festivals this year. Kino Lorber will open Mockler's Like Me in select theaters starting January 26th, 2018. Thoughts?